Readers: Here we go again! In the spirit of TGIF, here are several cartoons on events of interest that I wanted to comment on (and hear your comments on). After Barack Obama's autobiography made it clear that when he orders a restaurant doggy bag there's really doggy in it, fact checkers have now discovered that there's a major problem with the mysterious "girlfriend" that Barry refers to in his book: she didn't exist. Obama is now claiming that the unnamed girlfriend described in "Dreams From My Father" is actually a composite of the many, many, many heterosexual women he dated who have (with one exception) never come forward and never been found. In fairness, the Bamster said in the foreword (ha!) of his allegedly nonfiction book that some characters were compressed and composites. But Obama describes events like the racial insensitivity of his white girlfriend after watching an "angry but funny" black play, fighting with her about it, and her dissolving into tears wishing she could be black like him. Only this never happened to Genevieve Cook (the woman known to have dated Barack), meaning there is no substantiation whatsoever that the event ever happened...and that it wasn't just invented as another way for the future president to vent his seemingly bottomless resentment against white people. Elizabeth Warren, the woman who claims to have laid the "intellectual groundwork" for Occupy Wall Street, is a Democratic Senate candidate in Massachusetts - hoping to occupy Republican Senator Scott Brown's seat in the next election. And according to the Harvard law professor's resume, she also enjoys all the benefits of minority status, because she is a Native American of the Cherokee tribe. Except she isn't. Although claiming minority status clearly helps land a job at a liberal institution like Harvard, it now seems that Warren is unable to provide any genealogical proof that there has been a Native American in her family... although she claims that her great great great grandmother was a Cherokee. In the absence of any documentation of her ancestry, Warren insists that her "high cheekbones" should be all the evidence anyone needs. But even if her claims are true, that makes her just 1/32nd Cherokee...and 31/32nds baldfaced liar. This last story is by far the most important, and there's nothing funny about it. Human rights activist Chen Guangcheng has been bravely fighting the real "war on women" in China, battling the forced abortions which are part of the regime's "one child only" policy. As a result, he was held captive by the government and, only days ago, made a daring escape and found his way to the safety of the US Embassy. Or maybe we should say "presumed" safety. Because the presence of Chen, and the need to act on his situation, was politically uncomfortable for the United States - and the timing was awful, because Hillary Clinton was visiting China on a diplomatic mission and didn't want to rock the boat with Barack Obama's all-important moneylenders. Which is why Chen was told by US officials that his wife would be beaten to death by the Chinese unless he left the safety of the embassy (a charge which US officials deny). And so he was returned to the Chinese government...where he now lives in minute-to-minute fear for his own life and that of his family. Chen has begged to fly out of China on Hillary Clinton's jet and have his family be given political sanctuary in the United States. But so far, his requests have fallen on deaf ears. As of this writing, Hillary Clinton has made no public statements about Chen. And there's no chance that Barack Obama will stand up to China over a little thing like human rights violations and a brave man's life. He's far too busy telling the world how courageous he is. After months of heavy thinking and the expenditure of countless campaign dollars, Barack Obama's reelection team has finally settled on a slogan which embodies the president's leadership and crystallizes the myriad hopes and dreams of a desperate and weary American public. And that slogan is: "Forward." That's it. Not even an exclamation point (not that one is deserved). Just one word...and one which is even less meaningful than 2008's demonstrably empty "Hope" and "Change" or even the grandly self-congratulatory "We are the ones we've been waiting for." Still, Hope n' Change can understand the appeal of the word "Forward" to Obama's campaign team. Because it's the opposite of "Rewind" - a word which would invite voters to actually review Barack Obama's disastrous, debt-ridden, America-diminishing first term. And that's certainly no way to win reelection. Moreover, "Forward" has a long history of being a rallying cry for certain political movements. Specifically, Marxism and socialism, which may come as a surprise to the Obama camp...or may not. And of course, "Forward, Forward" also enjoyed tremendous popularity as a Nazi marching song, so maybe it's just the ticket to motivate black voters to (in Obama's words) "take off your bedroom slippers and put on your marching shoes." Frankly, the idiocy of choosing "Forward" as a campaign slogan is emblematic of the wretched decision making shown by this president in all areas, and the degree to which he and his cronies are out of touch with reality. Because when America is speeding towards an economic cliff, the last thing we want to hear from the guy driving the bus is "Forward!" Surely the greatest - and come to think of it, the only - accomplishment of the Obama administration was the killing of Osama bin Laden. 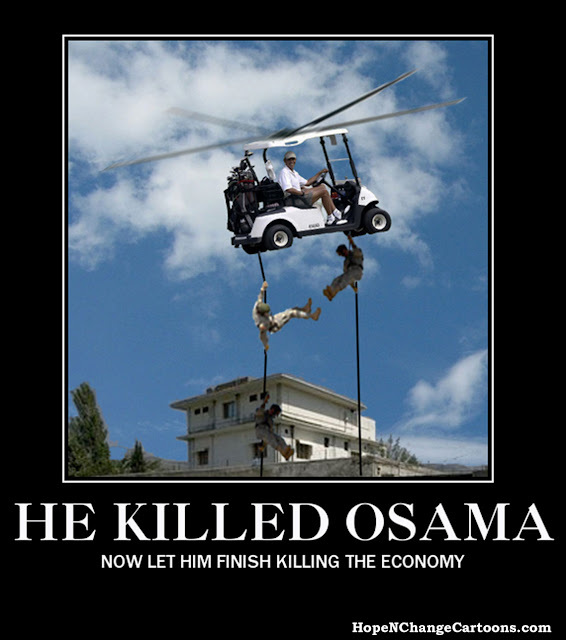 And now, on the one year anniversary of the terrorist leader's execution, Team Obama is doing everything short of carrying Osama's rotting, bullet-ridden head around on a pike in order to tell people that this bold and dangerous military mission could only have been pulled off by one man. And of course, that man is...Admiral McRaven. What - you thought Obama was behind everything? Bwah-ha-ha-ha-ha-ha! No, no - as the photos from the situation room clearly show, Barry had to be dragged off a golf course the day of the mission so he could be photographed watching a computer monitor in the same room as a lot of grown-ups. But a contemporaneous memo written by Leon Panetta makes it clear who was really in charge - and who would have taken it in the neck had the mission failed. Admiral McRaven was in charge of "the timing, operational decision making, and control" of the mission...meaning the only thing left for Obama to do was order finger foods for the situation room. The memo also makes clear that McRaven's mission was simply to "get" Osama - which could mean killing, could mean capturing, and could (and probably does) mean that Obama never made a decision ("gutsy" or otherwise) on which option should be exercised. But wiggle room was built into Obama's "go ahead" which would have allowed him to crucify McRaven if anything went wrong...instead of making the Admiral invisible when everything went right. But the fiction of Obama's deep involvement in the mission isn't standing in the way of perfectly good campaign grandstanding. Team Obama has just released a jaw-dropping commercial which asserts that if Romney had been president, he wouldn't have made the call to take down Bin Laden. And the ever-amusing Joe Biden hit the stump to proclaim that "GM is alive, and Osama is dead" because of Barack Obama...and under Romney, "the reverse" might be true. Politicizing the death of Osama bin Laden (and therefore 9/11) is reprehensible beyond words, and is made even worse by the fact that Barack Obama and his toadies are lying through their teeth about who really deserves the credit. Barack Hussein Obama did not order, plan, control, or supervise the mission to kill Osama. And God knows he didn't put his life - or his golf game - on the line. BONUS: Click on poster for a big, downloadable version!